She will be coming home! It has been an extraordinary 10 days. Life has been turned upside down and finally we are right side up. Gypsy will be coming home! She has survived and will once more be in clover as she is in this painting. It is hard to belive that day was just a short month ago. Friday was the turn around day and she has made rapid progress since. She is still in isolation but as soon as we get three negative readings on the cultures taken yesterday she can leave isolation, be in a regular stall and we can plan to take her home later this week. I know it will be a busy time when she comes home and it won't be business as usual for some time yet but I don't care. I am so incredibly thankful to have her back. All thanks to the best veterinary care I could ask for! 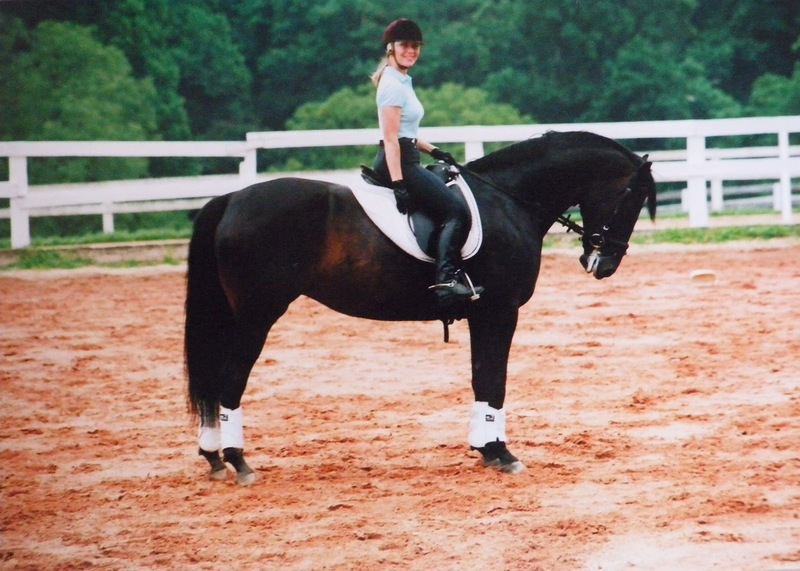 My vet Nancy Voytosh made all the right calls and then Gypsy was passed into the amazing hands of her surgeon Dr. James Brown who has also been there for both Gypsy and me every single day. He walked a real tight rope with her and brought her through. 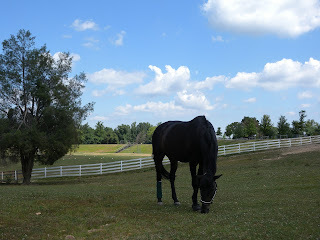 The caring staff that was with her 24 hours a day at the Marion DuPont Scott Equine Medical Center knows how hard isolation is for a horse and they saw to her needs and gave her lots of TLC. I took some wonderful landscape photos while I was there and plan to do some paintings from them soon. At some point I will go back and paint on site but not for awhile. I need to stay close to Gypsy so the next plein air pieces you see will probably be similar to the above. There is still a lot to paint here at her home barn and I look forward to some more cool days like today to set up my easel. 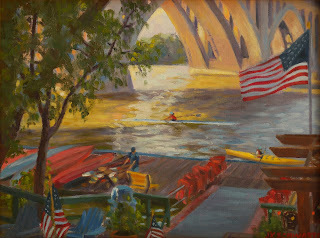 ON EXHIBIT THROUGH JULY; At the Art League Gallery in Old Town Alexandria...."Two Red Boats" and "The Dock at Jack's". ON EXHIBIT IN AUGUST: At the Salmagundi Summer Online Show, Wednesday, August 1st through Friday, September 28. Link to be provided soon. Paintings exhibited; "Evening Descends on Black Pond" and "Winter Gold"
I have mentioned my extraordinary mare Gypsy on a number of occasions and talked about my dual life long passions of horses and art. Those of you who are regular readers of my blog have been aware that I am once again missing in action. This time it is not because I am travelling or too busy out painting to sit down and talk about it. This time I am occupied with helping Gypsy fight for her life. Last Wednesday she was taken to the Marion Du Pont Scott Equine Medical Center in Leesburg Virginia for emergency colic surgery. It was a complicated one. She survived it. That was exciting news. Unfortunately the first day's elation soon evaporated when we realized the recovery was not going to be an easy one. My surgeon has been wonderful, the techs and all the support staff have been as well. It is a balancing act and a waiting game. We are leaving no stone unturned, running every test, making adjustments to medications, trying new ones anything to give her body a chance to recover. Tomorrow it will be a week post surgery. She took a downward turn today. She is baffling us all. I am there everyday and sit for hours outside the glass doors through which I took this photo. I cannot touch her. She knows I am there and every so often comes over and presses against the window. I know that if she does not improve soon there will be further complications and her body will just crash. The next couple of days will be crucial. Before the storm hit and we lost power I was blogging about the weekend I spent in Pennsylvania attending Bobbi Pratte's workshop at Willow Pond Lavender Farm in Fairfield. 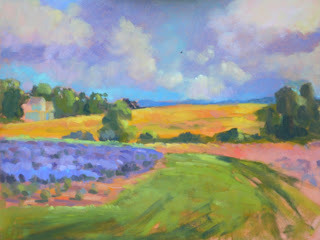 I showed you the morning painting I did and talked about the gourmet, lavender infused lunch served by the owner of the farm. After that some left to tour Gettysburg for a couple of hours and some of us decided to nap in the shade. You might remember the photo of my knees when I was stretched out. At 3:30 we started painting again and continued until after 7:00. We had been at the farm since 8:00 AM and fatigue was definitely setting in. Remarkably so was hunger which I didn't expect to feel after such a generous lunch! This is my finished painting from that afternoon and evening. The image below is how far I had gotten before stopping for the day. The next morning I opted to start a new painting rather than use the time to complete this. This one was finished at home in the studio. Some of the group on the lavender tour before we started painting. You can see part of the view I chose for my afternoon painting. I did use a little artists license and simplified the houses in the distance. The actual rooflines and gables were too much for the purpose the house served in the painting. I also added a little more lavender on the right side of the wide grass path between the fields. Since I started the painting around 3:30 and knew I was going to be painting into the evening I used what I know about evening light to move the sky ahead a couple of hours. My next post will be about the painting I started the following morning. It too had to be left unfinished but all the information I needed was there. Also check out http://www.theartleague.org/ and see the current, juried All Media Show on our website by clicking on flikr on the menu. While you are there be sure to visit the Art League Blog as well. 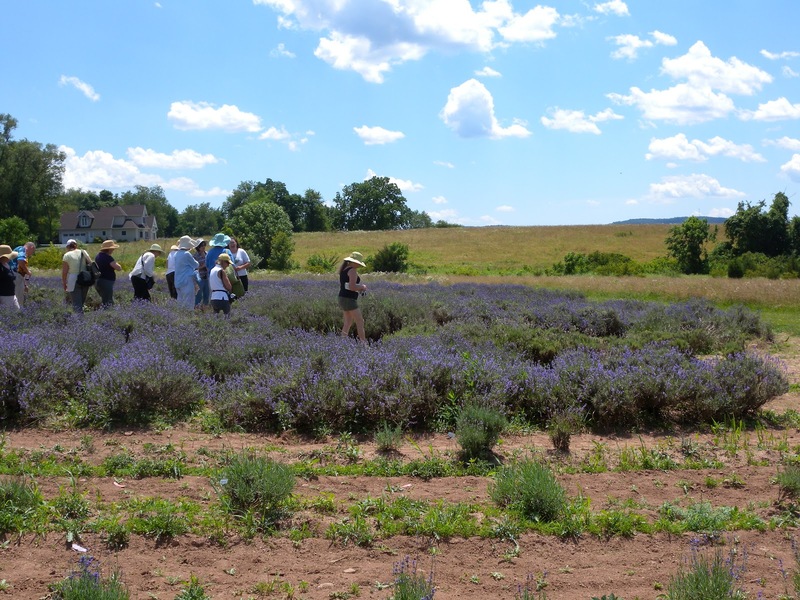 There are a lot of great photos there of this workshop in the lavender fields. Enjoy! Well, that was quite a storm! Here I was finally being a good blogger all enthused about blogging about my wonderful weekend in the lavender fields. Eager to show you the paintings on my easel in the field as they were underway and then the finished product. Then the derecho struck last Friday around 10:30. The WHAT? Yes, I had never heard of a derecho and you would think that being alive as long as I have I would have experienced such a storm at least once. I am quite certain I haven't. It was like a category 1 hurricane smashing through in a half hour with no notice. Actually we had about a minute's notice. We were watching tv around 10:30 when the program was interupted to announce the imminent severe weather bearing down on the Washington DC metro area. The weatherman never finished his sentence before the power went out with a blam! The power stayed out.....for us until late Monday afternoon. Sadly, there are still homes without power. Besides the power we lost phone service both land line and cell until Sunday morning. I think that was the worst. People couldn't even get through to 911! Add to this we are in the midst of one of the longest extreme heat waves in recent history. Triple digits all week. Relentless. Until this evening. We are having more storms but mercifully not severe and it's cooling down. Maybe I should keep my mouth shut. I am becoming a little superstitious. Enough about the weather. I haven't taken photos. I haven't painted this week. I DID tear apart the studio, dump a load of junk, reorganize and purchase a Todd Reiffer work station from a friend who is a pastelist and for whom the station did not work. I have been coveting one for some time. I was right to as this is the perfect addition to my studio. Now I am really psyched to get back to work. I will upload photos. Really I will. Unless there is another derecho and power outage. There I go again! 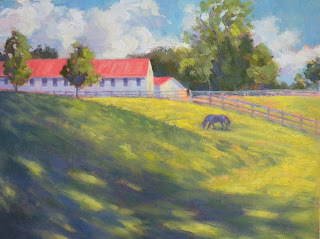 ON EXHIBIT: The little plein air painting above was juried into this month's show at the Art League Gallery. 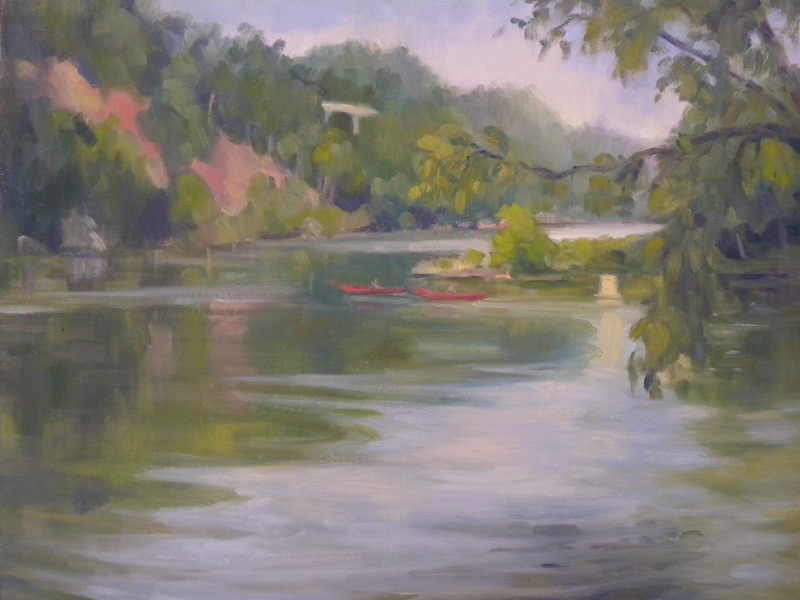 It was painted last September at Fletcher's Boat House on the Potomac. You can see it on the easel on the banks of the river if you go to archives and read the September 3rd 2011 post. ALSO ON EXHIBIT: For the Bin Gallery at the Art League this month I submitted this painting of Jack's Boat Rentals under the Key Bridge. I painted it either last July or the July before, I honestly don't remember but the date is on the back. I thought it was a good theme for this month. I love the colors and activity at Jack's and it was fun to paint it. The arches of the Key Bridge make the location special and a desirable subject. SO, WHAT'S NEXT? The show at the Salmagundi Club just closed and so has the Club. Renovations will begin in earnest and this was the last exhibit in the main gallery until the work is finished. Therefore, instead of a summer exhibit in the gallery we are having one online. I will have two paintings in that show and will let you know when, what and give you the link. I am still trying to decide which two I want to enter. 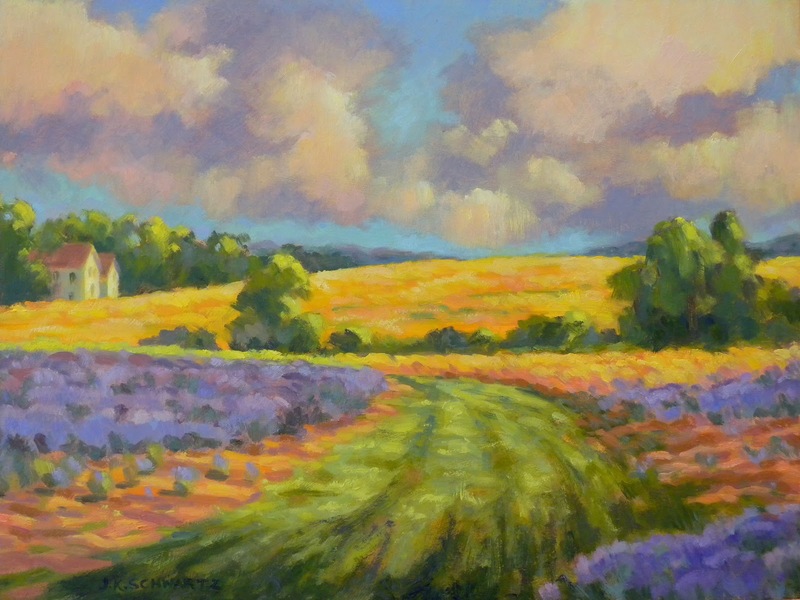 I also just sent two entries off to be juried for the Oil Painters of America Eastern Regional show which will be held in Bennington Vermont this September. I sent my two New York paintings from the Ratner show and I have my fingers crossed. Then in August the "Scapes" show takes place at the Art League gallery and I am also pondering which paintings to enter there. There's plenty going on and plenty of plein air outings looming so if I can nail myself down to the computer I will let you see what is being produced....soon.